Say a guy has not enjoyed the privilege of having a girlfriend in a long time; or perhaps ever. He will have at some point, whether told to him or an associate, heard the allusion that his right, (or left) hand is in fact his girlfriend. Usually, this is a humorous allusion to masturbation. However sometimes this refers to when a guy actually has a hand-sized girl magically grafted onto his arm. Ladies and gentlemen, allow me to introduce to you the premise of 2004’s Midori Days (yes I am being serious, does my deadpan tone not sound serious?). Midori Days is an anime adaptation of the manga series by Kazurou Inoue (Ai Kora, Aoi Destruction) of the same name. 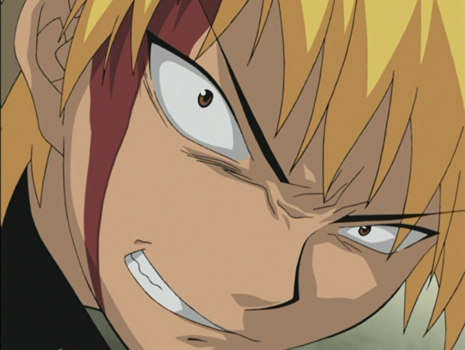 The anime was directed by Tsuneo Kobayashi (both Emma: A Victorian Romance seasons and Kurokami the Animation). Seiji Sawamura is the toughest badass around; mess with Seiji, and the last thing you’ll see is his right hand plummeting towards your face. As good as he is at fighting; his success with the ladies is inversely proportional. On a particularly bad day, Seiji exclaims out in the air, that he would take any girl who would have him. Enter Midori Kasugano, a girl full of energy and good cheer, who happens to have a huge crush on Seiji. Sounds like a perfect solution for Seiji’s companionship problems doesn’t it? From then on the story centers around the antics of these two as they try to keep Midori a secret while dealing with the antics of a cast full of weirdos and otherwise eccentric characters. Including the straight-laced, tsundere(A character who dislikes showing feelings that would make them look soft in front of people, usually due to pride), Takako Ayase, the creeptastic Takamizawa Shuichi who lives off of doll and puppets, the perhaps too precocious little girl Tsukishima Shiori. 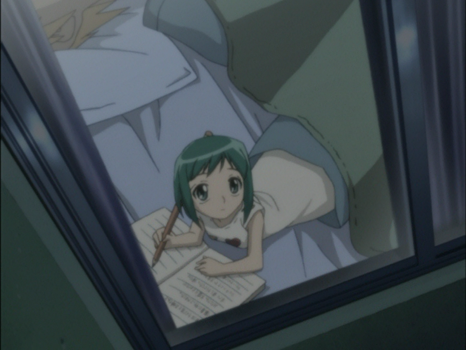 Certain Shonen romance series like Midori Days are often marked by a single unusual supernatural effect or circumstance that triggers the premise. Titles (Editor’s Note: These are all manga series but considering that Midori Days was based on a manga, this suits the same effect.) like Tuxedo Gin (dude gets turned into a penguin, protects girl he likes) Gacha Gacha Secret (dude has a crush on a girl, girl gets split personalities after a vacation, dude helps deal with the disorder) and Pretty Face (dude has a crush on a girl, he gets into an accident, is helped by a doctor who reconstructs his body into a girl identical to his crush, dude protects girl while looking like a girl) fit the same bill. Of course, everything sounds terrible when shortened to one sentence, but let us not pass judgments for now, for these type of series are usually known for a cast of crazy characters. Bringing me to my second complaint that the secondary characters just don’t interact with each other, (the number of times two secondary characters met each other are twice in thirteen episodes). Furthermore, Seiji and Midori never deal with more than one of them at once, so they never work off each other’s kinks, which he feels very much like a waste. Because it is so episodic, no one episode is particularly important to the show itself In fact, other than the first and last two episodes, you wouldn’t be too badly off watching episodes at random. While I tried to enjoy Midori Days, one thing really spoiled my fun, That being none other than our heroine Midori. You see, early on we learn that her real human-sized body is in fact off sleeping in Midori’s room, which also happens to be part of a large mansion. So Midori is filthy rich despite the fact that nothing about her demeanor would tell you that, but people can’t always fit into templates like that, which is a perfectly fine, even welcoming actually. But my beef with Midori is that she comes from a wealthy family that loves and supports her as well as some amazing friends, but we discover that the fact she can’t go back is because she doesn’t want to. Allow me to put this in perspective. Not only is this girl pestering, and at the same time, impairing a boy she likes by taking away his use of his dominant hand, but she is also making an entire household and group of friends who care about her (what? Suffer, depressed, you left a part of the sentence out)over a crush, not only that but a one-sided crush. Call me a bitter realist, but this sounds ridiculously selfish in her part. If she had a horrible life at home, that Midori would at least be justified on preferring her escapism, and in fact would allow for great character development for her to face her problems at home. But no, she is merely acting like a selfish, spoiled brat. Pros: An unusual taken on the formulaic harem genre. Funny characters with entertaining antics lead by a not so average male lead. Bring together a light-hearted, sometimes touching story about two persons that grow to love one another. Cons: An episodic, isolated, cast of characters who could breathe great life in to this show but are squandered for simple filler. Midori as the heroine is not such a great person in hindsight, despite the innocence and kindness she is often depicted with. Put down a show that could have accomplished much, much more. In conclusion, I believe that Midori Days is a show offering an unusual approach to the romance genres, but wastes this potential on under developed, episodic characters that bring little to the table. They may be funny sometimes, but are ultimately inconsequential. 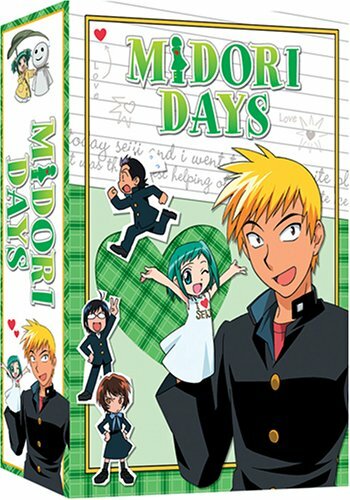 Now we used the Midori Days‘ box set cover released by Media Blasters for the review image, but our copy is a specific single box Handheld Edition that is cheaper and probably easier to find. So to put it in another way, mad dog Sawamura Seiji got into a brawl against the rest of the cast, and lost, badly, but that is to be expected when you are dragging along dead weight in the form of a clingy heroine, like Midori.